ON THE GO OC - Things to do with your family. : Los Cerritos Center Welcomes SANTA HQ Holidays Kick Off November 5th! Los Cerritos Center Welcomes SANTA HQ Holidays Kick Off November 5th! 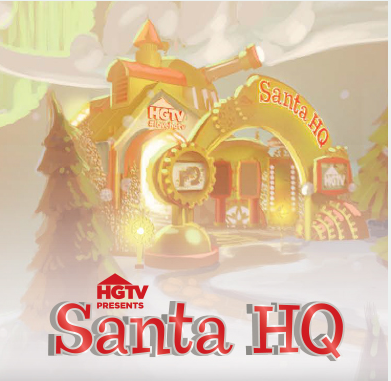 There is a new SANTA HQ Experience coming to SoCal! I love the Holidays and all the opportunities to be festive that come along with it. There are a lot of things going on and the rush of it all gets a bit much but you know you can't wait for it all just like me. When I plan ahead for the Holidays, I know two things, one... get gifts and two... make memories. The gifts are a process but the memories don't have to be. I like to search out fun things to do with the kids and family. We love to visit Santa and see his helpers too. The new SANTA HQ is coming to Los Cerritos Center and Santa makes his debut on November 5th to kick off the Holiday Experience! What: Santa is all about the experience and this year Los Cerritos Center has partnered with HGTV to present “Santa HQ.” Families are invited to experience the wonder of Santa’s workshop in the digital age. Exciting interactive technology transforms and customizes the experience. This engaging new version of a visit with Santa uses digital tools to offer an augmented reality environment and a thoroughly new, enhanced social media experience for families. At Santa HQ, kids will be “scanned” as they arrive to determine if they’ve been “naughty or nice,” enter an observatory where they will use special tablets to view Santa’s magical world - the night sky or Santa’s elves at work, for instance – be able to take an “ELFIE” (a photo opp as a dancing elf) and much more. Early Bird Photo packages are also available starting at $34.99 through December 8. As an added bonus, guests can start to make reservations with the man of the hour now by visiting www.santa-hq.com. Shoppers also are invited to bring in an unwrapped toy and participate in Help Through Holiday Giving. Los Cerritos Center hopes to gather enough toys to beast last years ABC7 Spark-Of-Love Stuff-A-Bus Toy Drive record of nine commuter busses. All Toys will be donated to Spark-Of-Love on December 2. Join Mrs. Claus as we welcome Santa back to Los Cerritos Center and his headquarters. Join us for a special holiday craft, hot coco, gift bags and your best chance to visit with Santa himself! November 5 - December 2Join in a 20 Year Tradition of bringing holiday cheer to children in Los Angeles County. In partnership with the Southern California Firefighters help us collect new and unwrapped toys to benefit kids in LA County. Bring new unwrapped toys or sports equipment Santa HQ Nov. 5 through Dec. 2. So don't forget to reserve ahead and make sure you don't miss out on the HQ Fun! Santa HQ will be open 7 days a week from 11 a.m. until 8 p.m. and is located in the Main Court next to Forever 21. Santa will be available for photos and visits at his Headquarters presented by HGTV, located in the Forever 21 Court. Reservations available, but not required!